Last year for Mother's Day one of my sister's and I went in together and sent my mom this book. It had received good reviews, but I had not read it. I finally got my hands on my mom's copy and took a few days to read it. I LOVED it and can't wait to get my own copy. 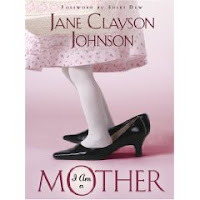 Jane Clayson Johnson, a former co-host of the Early Show on CBS addresses the question - how do we stop saying we are just a mother? The book really opened my eyes, I became a mom a little over 5 years ago, and have always been blessed to stay at home with my now 3 little ones. I know this is a blessing, but sometimes I wonder if anyone knows or cares that I once worked a great marketing job, that I did graduate with a Bachelor's degree, that I could still do any number of things and work full time, but I choose to stay at home. This book was exactly the boost that I needed. I am a Mother, I should be proud and I should never be ashamed of my decision to stay at home and be with my children. I recommend this book to anyone, stay at home moms, working moms, sisters, daughters, even husbands and sons should read this book. It has an inspirational message that is good for all.